Consisting of horizontal carousels, put-to-light technology, and control software, Consolidation Carousel System provides method of consolidating orders picked from multiple work zones. Software designates specific cell locations in bin for completed order, while put lights indicate where to place each portion of order. When last tote or container from pick zone hits consolidation workstation, put lights automatically blink telling operator that order is ready to ship. The new Remstar Consolidation Carousel can improve order processing time in applications by providing a cost effective method of consolidating orders picked from multiple work zones. The Remstar Consolidation Carousel system consists of specially designed horizontal carousels, put-to-light technology and control software. Items picked from multiple work zones are conveyed to the consolidation carousel work zone. The software automatically designates specific cell locations in a bin for the completed order. The carousels put lights indicate to operators where to place each portion of a specific order. When the last tote or container from one of the pick zones hits the consolidation workstation, the put lights automatically blink telling the operator that the order is ready to ship. The Remstar Consolidation Carousel is a system of carriers that rotate on an oval track. The high-density design of these systems uses up to 350% less floor space than conventional conveyor, cross belt or tilt tray consolidation systems and costs up to 50% less. The system has the capacity to handle up to 300% more open orders since the system doesn't require any dedicated pick lanes and recirculation capabilities. Likewise, the consolidation carousel system requires up to 80% less labor since one operator is maximized by using a work station of two carousels simultaneously. Remstar International Inc., a company of the Kardex AG Remstar International (KRI) Group of Zurich, Switzerland, is a leading provider of automated storage and retrieval systems for manufacturing, distribution and warehousing applications. For information about the Remstar consolidation carousel, call 800-639-5805 or visit the Remstar web site at www.Remstar.com. 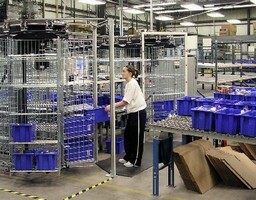 Automated Drawer Carousel maximizes parts storage density. Baggage Conveyor comes with integrated maintenance tools.